B1437. JOSEPH SZIGETI. 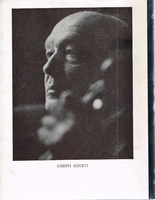 Szigeti on the Violin. New York, Praeger, 1970. 234pp. Index; Musical Examples; Photo; DJ.